This hotel is well located if you are interested in the opera, museums, theater, and shopping. It has been our first choice for six years. The concierge service is outstanding. They have recommended excellent restaurants that we had never thought of and scored some great theater tickets. The lounge level is very convenient for breakfast, lunch, a light dinner, and drinks. This is a great hotel right off of Central Park. As you enter the doors, the lobby and bar/cafe give you a warm welcome. The rooms are classic contemporary with excellent temperature controls and sound proof windows. The decor is very tasteful. One problem that I had was with the bed. I had back pain after sleeping the first of 6 nights. The staff was accommodating to add another pillow top to the bed. However, this gave little relief. I must say that I seldom have any back discomfort on beds so this was unusual. Especially since this was my second visit to the Ritz in the last year. I had no issues the first visit at all. The only other issue was service in the bar. Unfortunately you have to flag staff down to get a drink and then later for your check. There were 3 servers and a host for approximately 12 tables of clients requesting drinks. Seems to be more than adequate staffing for cocktails and snacks but the service was very slow. Hopefully this will improve with some staff training and the addition of their soon to be renovated restaurant (it was closed at this time for renovation). Overall a good experience with a few glitches. Thank you for taking a moment to review your recent stay. While we enjoyed hearing you had a good experience, we regret we did not execute an exceptional visit with the couple glitches you mentioned. We appreciate you bringing this to our attention and rest assured, we are working to ensure this is an isolated occurrence. Again, we thank you for your comments as this only improves our operations. We hope to have the opportunity to welcome you back soon so that we can build your trust again. I came to NYC for my first mom/son trip. I failed at making it memorable with the plays, museums and park outings, since The Ritz Carlton is what stood out most for my 8 year old son . Alex, checked us in, engaged my son in conversation and was genuinely interested in our weekend plans. The front door staff brought him a football and remember our names every time we passed them- I mean they met us for 30 seconds and remembered our names! . The room service gentleman was so accommodating to our needs as was the Spa staff. We came home after a day out to a gorgeous plate of deserts, a chocolate made Into an Empire State Building and loads of cookies, my sons face lit up!. And then right before bed, a knock on our door with a delivery for my son- a kind note from Alex, remembering that we mentioned we were seeing King Kong on broadway- a gift of a King Kong mug, and a stuffed animal. My son was so grateful for this gesture he wrote him a thank you note. Aside from a gorgeous LARGE room, stunning bathroom, a restful quiet sleep, and beautiful location across from the park, the service at this hotel is in a league of its own. On a recent business trip to NY, I decided to join a colleague at a NY Mets game...The staff at the Ritz Carlton (Central Park) always exceeds my expectations, but this was truly AMAZING! Thank you to the ladies and gentlemen of the Ritz. 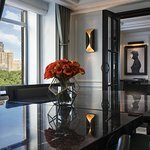 This hotel facing Central Park is perfectly located as youâ€™re between 5th and 6th Avenues and at walking distance of all Midtown famous restaurants from 59 to 55 Streets. The rooms are quite nice and decorated in a sober way. Unfortunately the hotel restaurant was not in service due to its current renovation.